By Ashutosh KS in Mobile. Updated on July 29, 2016 . Programming can be fun when done with the right tools – development tools that let you write and test the source code without pestering. Coding on the computer is surely more congenial, but it cannot beat the convenience of viewing or editing the source code from anywhere. This is where mobile devices come in handy – you can carry them anywhere and do your tasks from your own comfortable place. The Android app ecosystem offers a plethora of applications for programming. The Google Play Store is full of apps for all your coding needs – code editors, compilers, and development environments, just to name a few. They are all different and come with a varied set of features and drawbacks, which makes selecting the best tool a challenge. This is where we come in. Let’s take a look at the top 5 code editors for Android that can help you code, edit, compile and run your source code on the move. 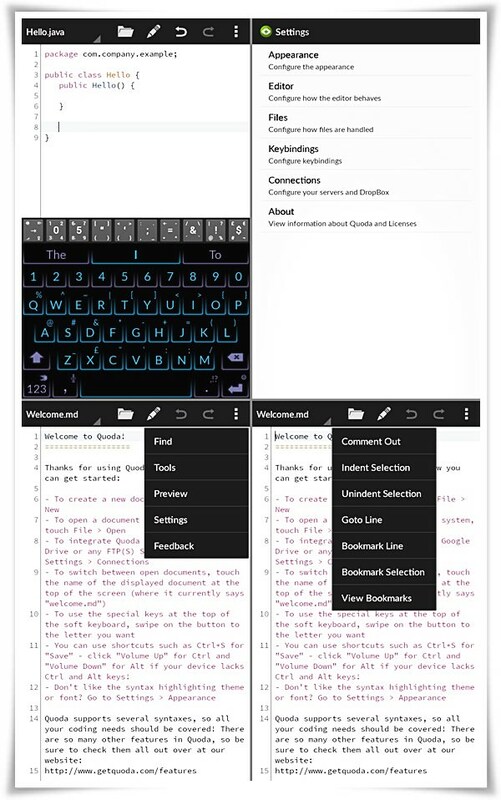 Quoda is certainly the best free multi-language code editor for Android. It is a powerful yet easy source code editor, and comes with nearly all the essential features that a software programmer would need. It also bundles various productivity-enhancing functionalities that can boost the developer’s efficiency. It is packed full of many useful features such as syntax highlighting, auto-suggestions, line bookmarking, auto-indentation, etc. DroidEdit is a source code editor and text writer with a clean and simple interface. It has multi-language support with features to help you achieve your goal easily and effectively. It is for Android as Notepad++ is for desktop operating systems – that means it can be used to open and modify simple text files as well as source code files of various programming languages. DroidEdit offers syntax highlighting that comes with support for more than 200 languages, and many built-in themes as well as an option to create custom color themes. Writer mode turns off the auto-correct and switches on the spell-checker. 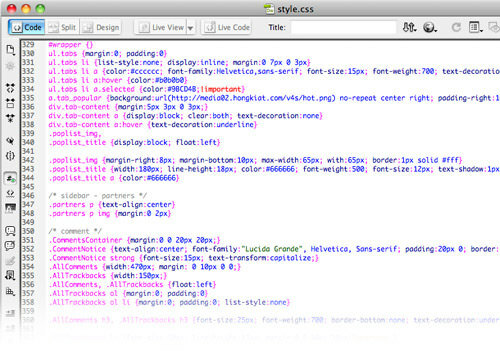 Emmet can be used to expand simple expressions into full-fledged HTML code. 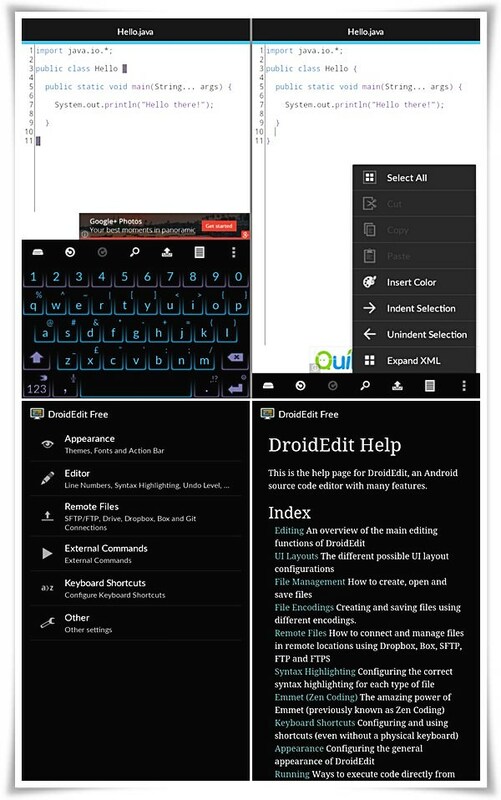 Other features include line wrap, search and replace, extra keys on your keyboard for faster code typing and even support for editing system files on your rooted device. AWD is a simple yet effective code editor for writing or editing the source code of your project’s files. It supports various productivity features including code highlighting, code completion, error checking, code beautifying, fast navigation, search and replace among other things. It even offers a quick preview of your web pages inside the application. AIDE, which stands for Android IDE, is a complete integrated development environment for Android development. It lets you code and develop Android applications right on your Android device without the need of a computer system. You can also learn how to develop Java and Android applications. Programming lessons are interactive with step-by-step instructions, which help amateurs to easily learn the skills of app development for Java and Android platforms. CppDroid is a simple yet powerful integrated development environment for C and C++ development. It is a fresh baked application, which brings the GCC compiler to Android. 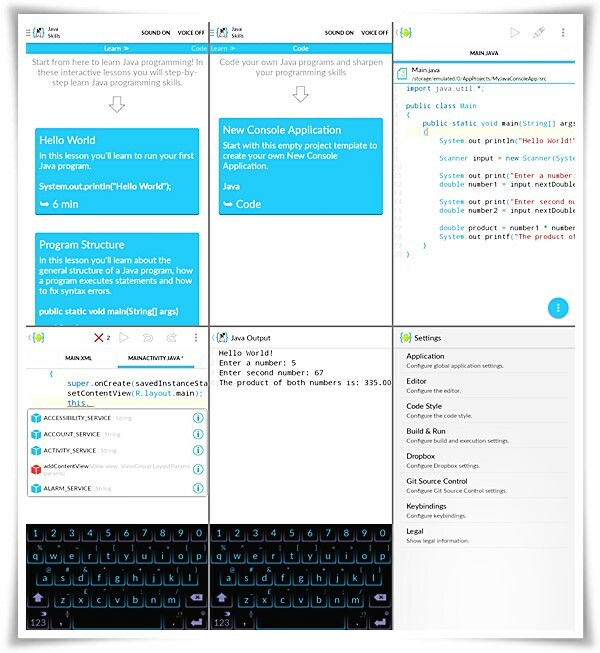 It allows you to code, edit, compile and execute C/C++ programs on your Android device without any difficulty. It comes with various demos or practice programs, which can help you learn the basics of programming in C and C++ languages. 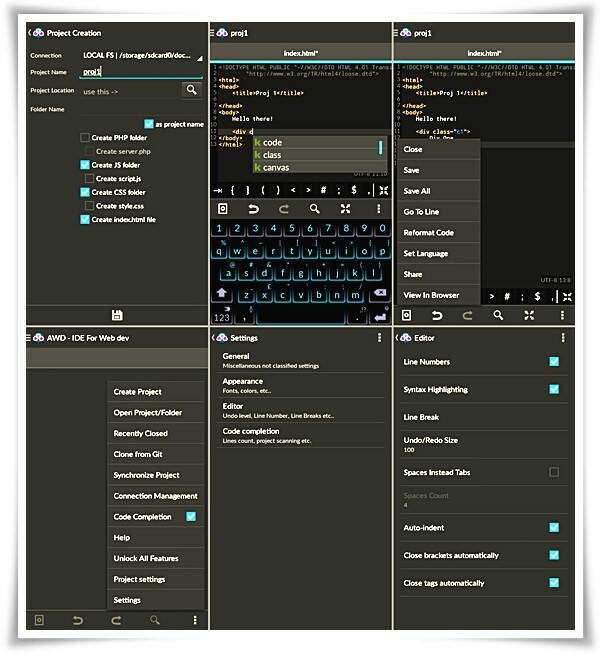 CppDroid offers an intuitive code editor that comes with various features for productive coding. Syntax highlighting is smart enough to highlight various parts of the program, and offers an option for configurable themes. Other features include auto-indentation, code-completion, real-time diagnostics (warnings and errors), file and tutorial navigator, and terminal emulation to run your compiled programs. How do you choose the best one from the given code editors? It all depends on your requirements. Have a check on your needs and just choose one from the above that meets what you’re looking for. 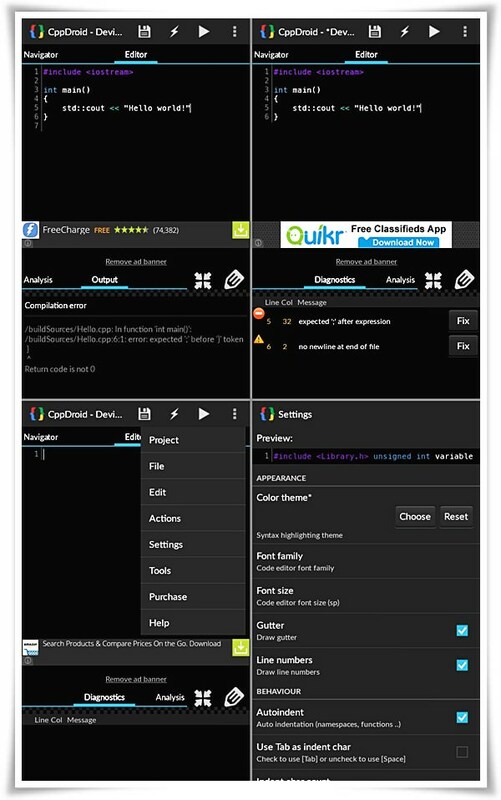 Which is your favorite code editor for Android? Did we miss your favorite code editor? Let us know through the comments.